Bad art is depressing. So is good art. The art that counts is the one that triggers a response. Q & U look the same. Side-eyed, tall, and a tiny little mouth, they make “The Bride.” They could also be twins. Kill Bill is The Wedding Album by John & Yoko, another pair of twins: east meets west in a string of bodies and mad sonata singing. Death is white. Death is beautifully white. Both Kill Bill and House Of 1000 Corpses (dir. Rob Zombie) want to be bad, but absorption is not the gap. Rather, it is the way the drive is executed. House looks good, but the action is unimpacted – the ambition is stifling. Q.T., on the other hand, has a rhythm of light and shade that invokes the past in order to work it out through his chosen medium. Rob Zombie is gift-wrapping wallpaper. In Q.T.’s head, everything springs from the music. Not only does it comment on the film, music is the battery. The scene is set, and the last conclusive flourish is voiced. Like Stanley Kubrick, he makes full use of the cinema – not one element is poor. And like Elvis Presley, the black influence is real and legit. The boy has groove in the heart. Roots. Somebody (it might have been Elvis Mitchell) said Q.T. is like a D.J. for the movies: he reconfigures the old media to show “our modern vacuity,” yet does it in such a playful way that he comes off as edgy and cool. Q.T.’s films are much too personal to satisfy that argument. He loves what he does, and the act of theft is smooth and vibrant. He’s a romantic. Kill Bill gives back to cinema the symphonic movement of music, and by taking it up whole, Q.T. has made the verbal physical. It’s kind of operatic. Reservoir Dogs is a play. The primeval stamp of Kill Bill turns the parley into action, and exposition is immediately clear. Q.T. has no room for subtext or the “deep meaning” (description is a waste, and time is relative), but each suite of the film has enough steam for nuance, and vice versa. The film has been judged in terms of the way it sounds (mostly), but not the way it feels – as if technique, by itself, wards off any investment on the part of the viewer or the filmmaker. It’s not what you do, it’s how you do it. The long cool stride, shades, leather… The only thing that gives is knowing you’re a crazy little kid till the day you die. Q.T. knows it, and he lives it. The Bride makes a death list. Therefore, not only is she Charles Bronson, she is Santa Claus, for the death of her enemies is the greatest spite they can receive, and the best gift she can get. The Bride is a wronged woman, and the movie is full of wronged women. Of course, it is more than a chick flick, but maybe that’s what it wants to be (and what saves it). Q.T. 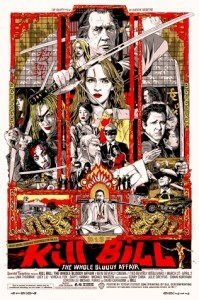 has respect for the characters (the writer’s first rule), and in remembrance Kill Bill is unexpectedly solemn. It builds a pattern of trauma and “destructive childhood legacies.” It is the most empathetic film he has made. Q.T. has a gut wit. He refracts the movie past that strikes a mass nerve. But Kill Bill is more than a mash note. The Tarantino oeuvre is a fruited hibernation, a loving report on what the movies mean to him. (Also, Kill Bill is a DVD readymade: the chapters stand together or alone.) Like Heaven’s Gate, or Gangs Of New York, the film is about the Herculean effort behind its making. It has the gusto of a silly, naked ego. By announcing that Kill Bill is “The 4th film by Quentin Tarantino,” Q.T. whips himself up with a wink. It might not be necessary, but it is fun.